The exact origins of Tambour embroidery are not all that clear. However it is thought to have been brought over to France and Britain from India during the 18th Century. There is evidence to suggest that examples of Tambour were exported by the East India Company as early as the 16th Century. Tambour beading was considered an exotic and sociable pastime as once mastered it didn’t require lots of concentration, ladies could gather and stitch while socialising, proving it to be a very popular technique. Charles Germain de Saint Aubin born January 17, 1721 – March 6, 1786 was a French draftsman and embroidery designer to King Louis XV. 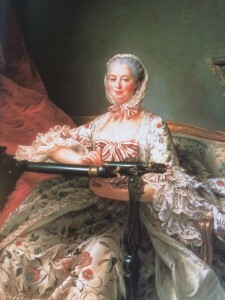 Charles pioneered Tambour embroidery, naming the technique ‘La Broderie en Chainette et au Tambour’. So called because to work Tambour, the fabric should be very tight in the frame, like a Tambour drum. To know you have your fabric tight enough it should make a very satisfying pop sound as you take your hook down through the fabric. He also published a classic reference on embroidery, L’Art du Brodeur (“Art of the Embroiderer”) in 1770. 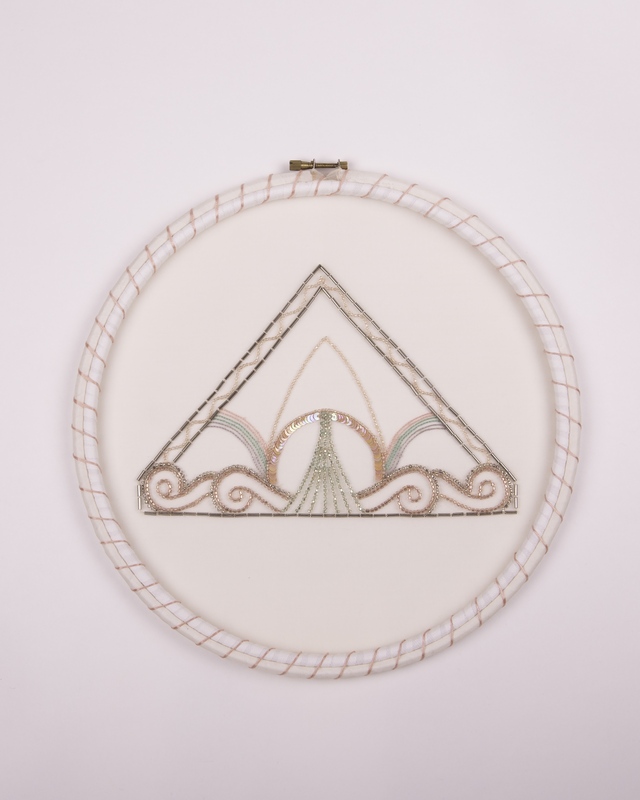 His parents, Germain de Saint-Aubin and Anne Boissay, were also professional embroiderers. Tambour chain stitch was also used as a quick and efficient method for recreating the effect of French laces which had become so difficult to come by between 1780 and 1850. 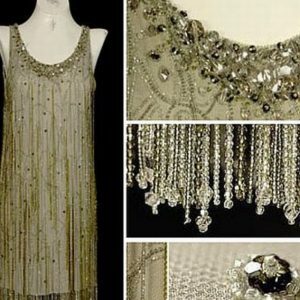 During the 1920’s, my favourite era for style, flapper dresses came into fashion. After the end of the First World War people’s wealth started increasing and women gained the right to vote. With that came more freedom which was reflected in the way they dressed. Hem’s became a little shorter and arms were exposed. The flapper lifestyle was not for the faint hearted and only the young indulged, with elder women looking down on such a frivolous way of living. With the simple shape and drop down waist of this new style of dress, women were able to make their dresses themselves. 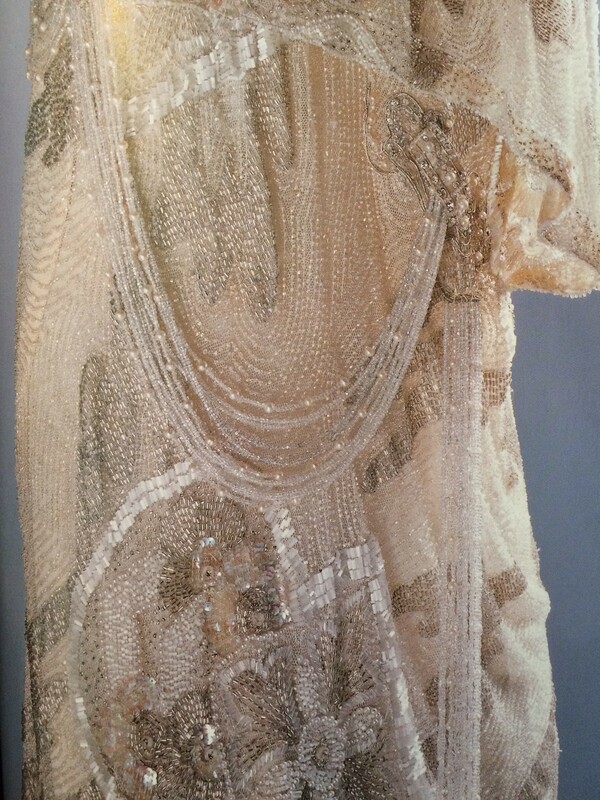 The evening dresses were frequently adorned in heavy beading and sequins that had been tamboured in typically geometric patterns, a signature style of the time. This gave wonderful movement to the dress as they danced their way through the Jazz age. 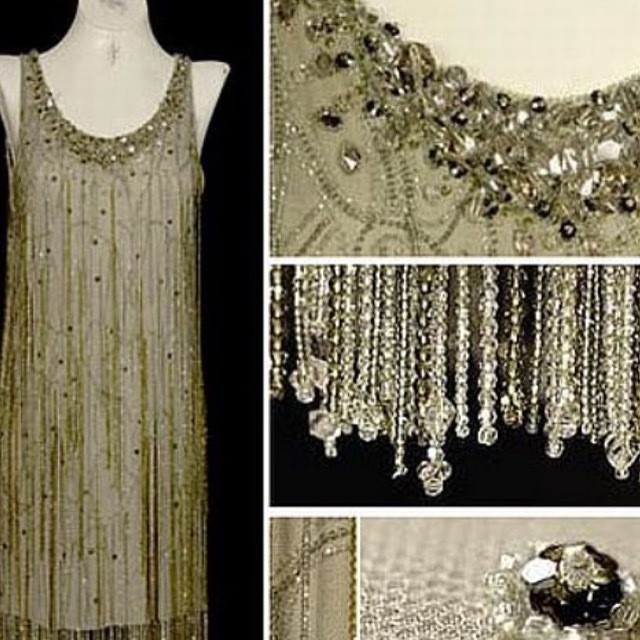 Although technically not 1920’s, below shows a wonderful example of Tambour beading and how heavily dresses were starting to be embellished with beads and sequins. Today Tambour beading is used widely across the fashion industry and throughout the couture fashion houses of Paris. Once mastered this technique is an incredibly quick method of applying beads and sequins and it can also be used to create a decorative chain and satin stitch. Below is a corset I tamboured for Saint Hill Von Basedow, covered with 1000’s of Swarovski crystals. 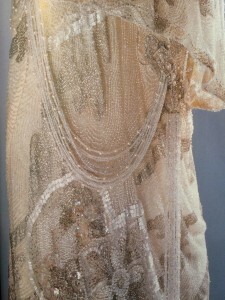 Tambour Beading has long been a highly kept secret, with the technique being confined to within the walls of the couture fashion houses. However, there is a growing number of experts who are willing to teach this technique to the inquisitive and patient students that await. I must be totally honest, I didn’t find Tambour beading to be the easiest of techniques when I first started. It’s a little bit like patting your head and rubbing your stomach at the same time. My first attempt saw me take 30 minutes to complete a line 5cm long! However I persevered and with the advice and help of a wonderful tutor I relaxed into the technique and it soon began to flow. Today, it is my favourite technique to teach and to work for myself. There’s a certain, calming and therapeutic stillness that comes over you when you are comfortable with this technique. I have had many wonderful opportunities to work some really amazing garments and below is one such example, the dress I made for Kate Moss that she wore to Swarovski Fashion Rocks. Tamboured in over 60,000 Swarovski crystals onto two layers of georgette and one layer of silk tulle net, it took three of us, over 3 weeks to work. 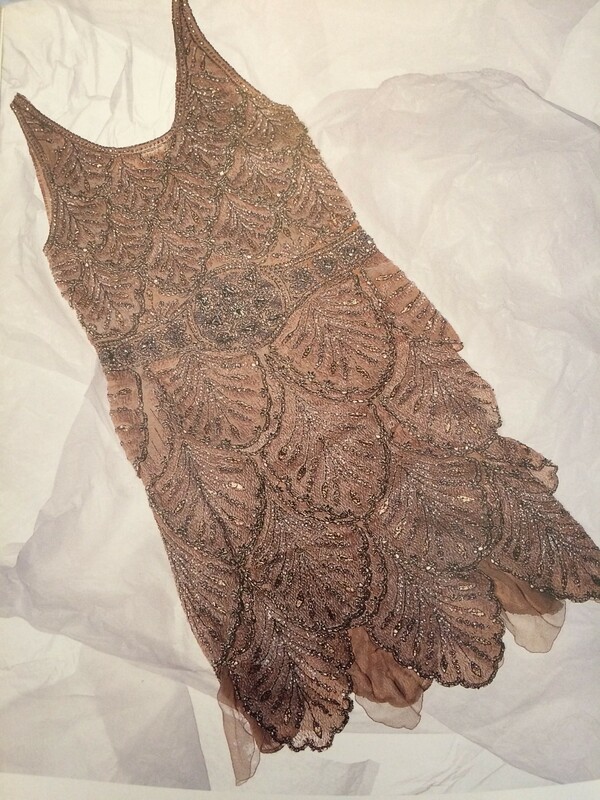 It was inspired by a 1920’s dress that Kate had in her collection which she wore the first time she met Jonny Depp. It was later reproduced for her Topshop collection. Tambour is worked on the reverse of the fabric, with your beads and sequins underneath. 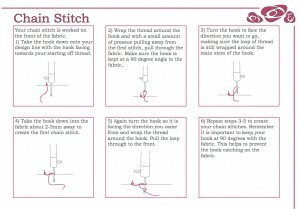 Unlike conventional embroidery it does not require a needle, instead you work with a hook, collecting the thread from underneath the frame, pulling the tread through the fabric and then taking the hook back down into the fabric, leaving a chain stitch on the top and your beads secured on the reverse. It is easiest to start with an organza so that you can see what your hands and hook are doing, however once you become proficient you will find it easier to work with an opaque fabric. 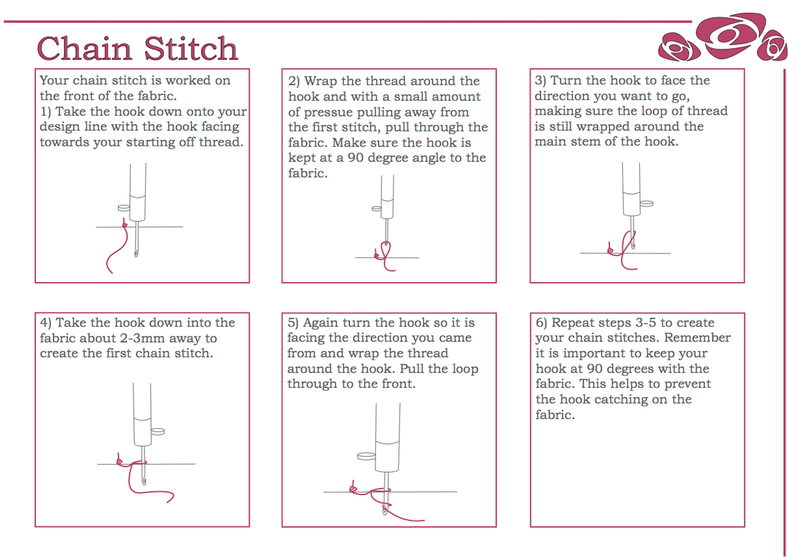 Click on the image below to find out how to work the basic chain stitch. 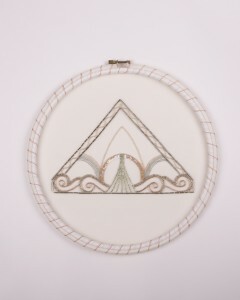 Instructions taken from the Well Embroidered Tambour kit. If you are interested in learning this wonderful technique then I have put together a tambour beading kit with full, detailed instructions as seen below. Click here to buy. As always I hope you have enjoyed this post, feel free to comment with any questions. Hi, Thank you for your question. 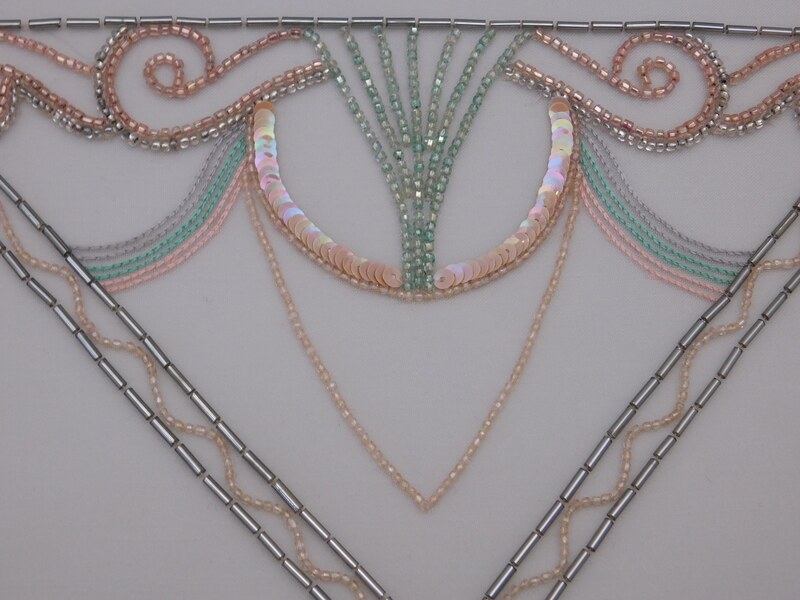 Tambour beading must be done in a hoop or on a frame as the fabric needs to be stretched tight. Due to the stretch of scuba fabric you therefore can not tambour onto it. Any application of beads or sequins would have to be done with a needle.